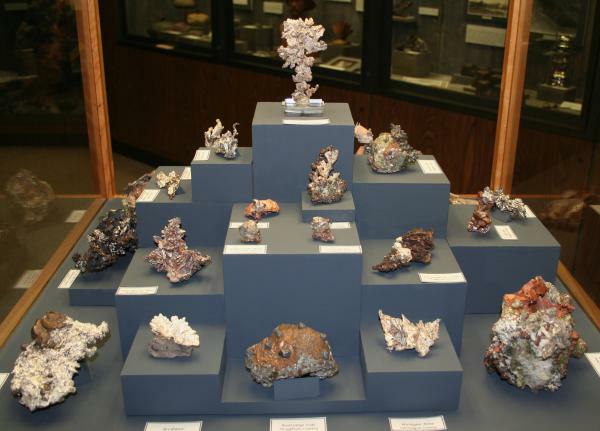 I recently had an opportunity to revisit the A. E. Seaman Mineral Museum, at least part of it. 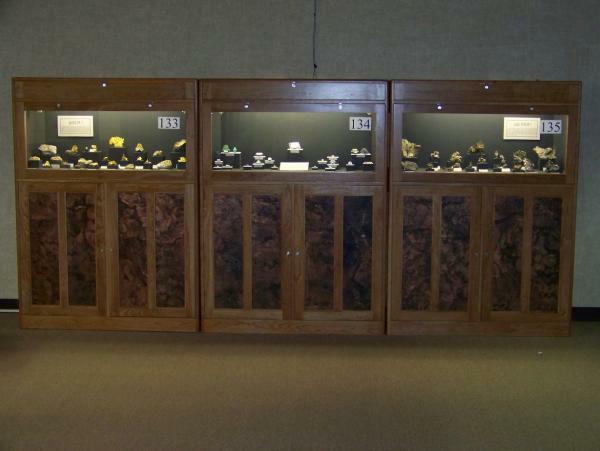 The minerals are being packed up and put into storage until a new museum is built on the campus of Michigan Technical University. The construction of this museum has just begun. However, this move is intended to be just a temporary one as a permanent museum is planned for one of the old mine buildings not far from the University. 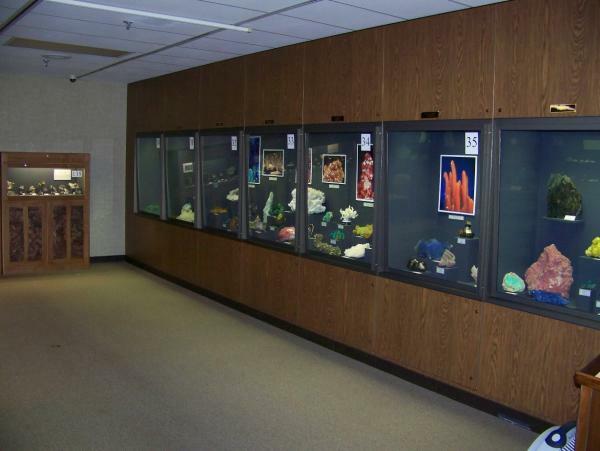 Fortunately I was able to see many of the display cases before they were emptied and put into storage. I had seen this collection many years ago but I had forgotten how extraordinary it is. My revisit practically left me speechless as case after case was filled with unbelievable specimens. 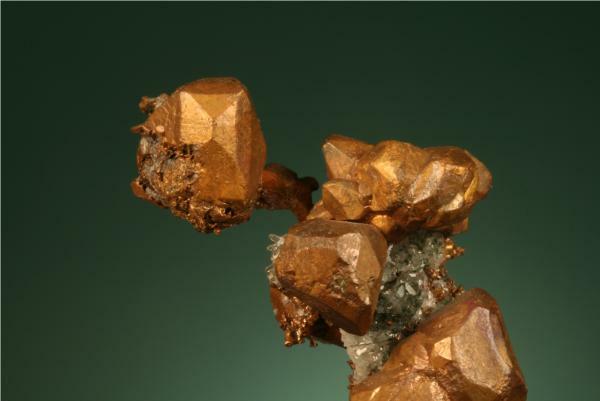 The minerals from the copper and iron mines of northern Michigan are simply wonderful, which is what one would expect. The quality and the variety and the numbers of exceptional specimens is far more than one might expect. 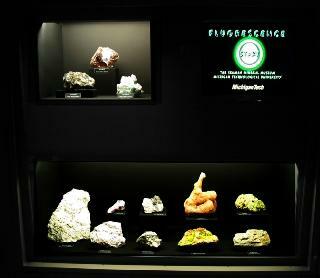 But this is not just a collection extremely rich in local minerals. 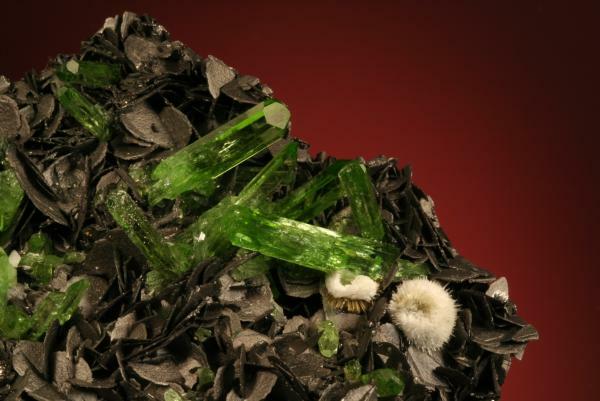 The worldwide representation is also extraordinary, so that altogether these representations easily make this museum one of the finest public mineral exhibitions in North America, if not the world. I do not make this comparison lightly. 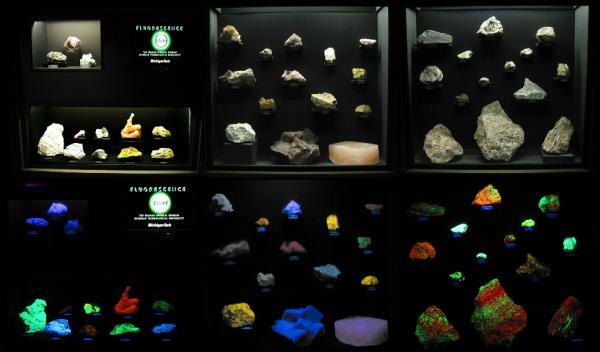 I have seen most of the great mineral museums across the globe (except for Asia) and so I feel qualified to make such a judgement. 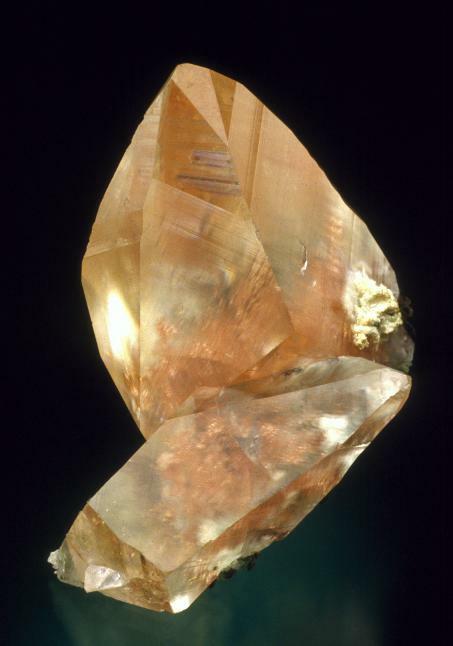 Not only are the minerals outstanding, but they are presented very effectively. 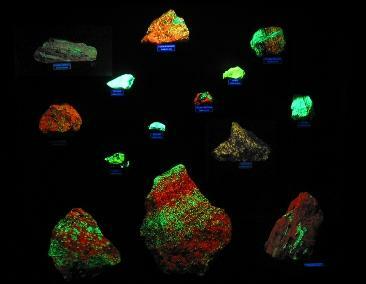 The fluorescent mineral case is by far the best and most effective and educational of any I have ever seen. 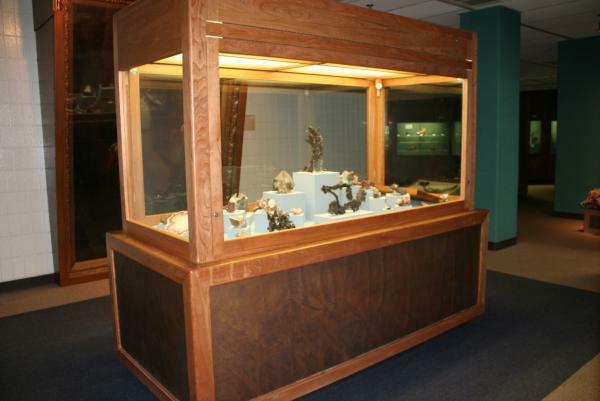 The old wooden cases seem to complement the style of the displays and it is my understanding that they will be utilized in the new museum, which is now under construction. 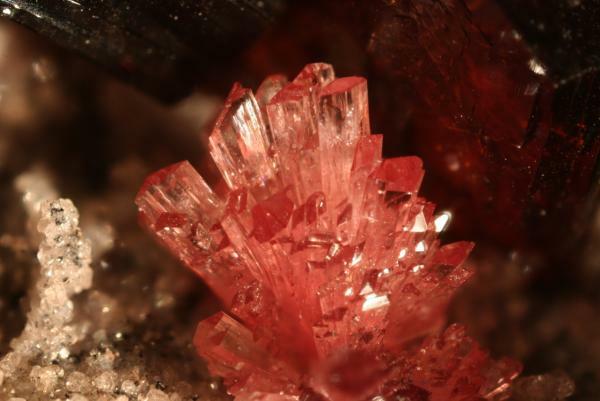 Here are some photos of some of the minerals, photos supplied by John Jaszczak, adjunct curator, chair of the museum society and professor of physics at Michigan Tech. I hope he will jump in and add details and other photos to this thread, now that it is started. I second everything John said here (just in case anyone thinks he was exaggerating). I gave a lecture there several years ago, which enabled me to see the museum, which otherwise lies in a fairly remote part of the USA, far from the usual travel lanes. 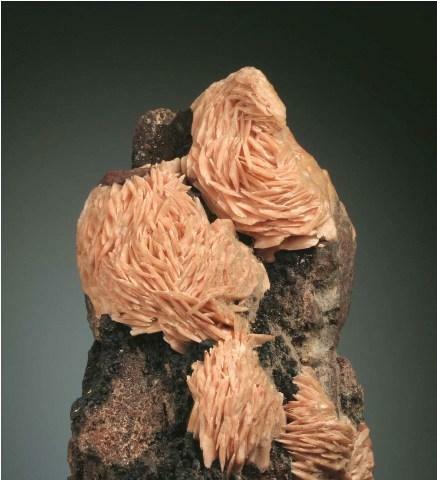 Definitely in the top ten mineral collections in the world. But it's well worth going out of ones way to visit it. And to add some cream to the cake, the local scenery is beautiful, and there are still mine dumps that can be collected on. Thank you for starting this thread and for the kind words! Thanks to you also Alfredo. I hope you both will be able to visit again once we reopen. The museum is closed, the specimens are packed up and safely stored, most of the cases are in storage, and the many wall cases that lined almost 75% of the old site's outer walls are being disassembled for reassembly in the new facility. I'll post some images of our old galleries, some of the packing process, and the progress at the new site. I'm mostly an observer at this point since I'm busy teaching. 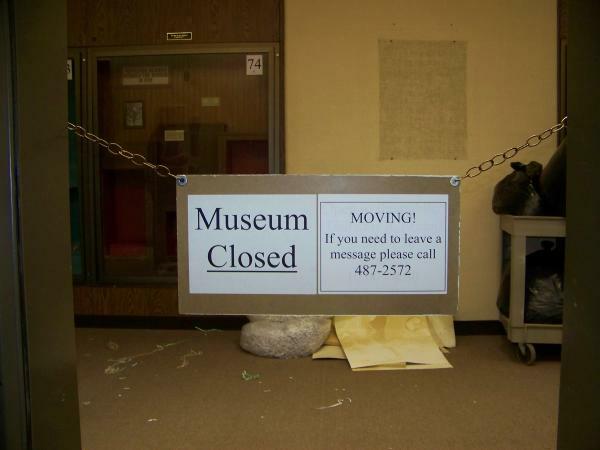 The museum staff has been working heroically! 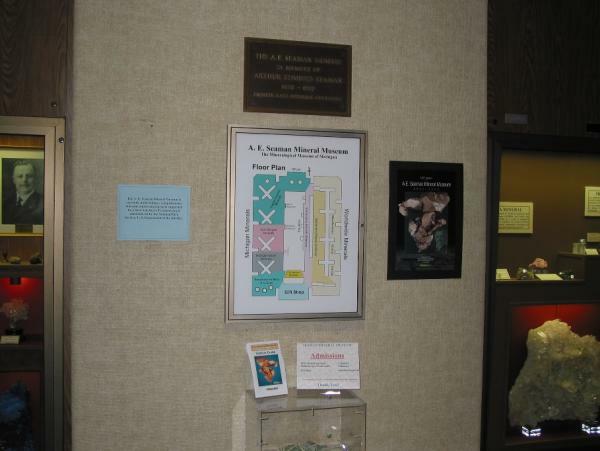 "Closed" in its former location on the 5th floor of the EERC building on the Michigan Tech main campus, where the museum has been since 1976. As a Michigander would like offer a few observations regarding the Copper Country. I live in southern Michigan and find that even life long residents here often know little about the Keweenaw. But then by way of the Mackinaw Bridge it is a drive of over 500 miles to the region and you never leave the state! Today only 3% of the Michigan’s population (yoopers) resides in the Upper Peninsula. It is out of the way even for most of the states residents. During the copper boom (roughly dated from the mid 1840’s to the 1890’s) the Keweenaw region of Michigan grew into a major economic and cultural center. 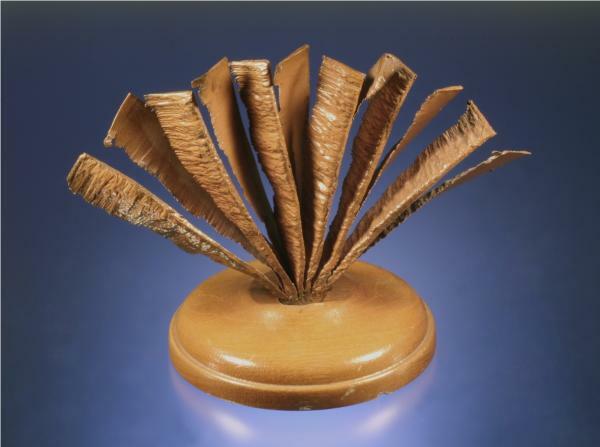 At one time it had the best libraries in the state and popular entertainment venues. Calumet [dominated for years by the mines of Calumet & Hecla Company] was once considered for location of the state capital. However, even before the turn of the last century copper production was shifting to the western United States. Labor unrest lead to the troubled strike of 1913. One of the goals of that strike was to provide miners with a $3.00 workday. This was strongly resisted by the mining companies. Further, as shafts went deeper for copper ore at ever greater expense (the lowest level of the Quincy is 1.9 miles below surface) the yield per ton declined. In about 1914-5 Henry Ford offered workers a $5.00 workday assembling automobiles in the Detroit area. Trains south out of Calumet packed with miners transported the labor force for Michigan’s next economic boom. Despite boosts in copper production during the two world wars Michigan’s contribution to the world supply continued in net decline during the last century. Today there are no copper mines in commercial production. The last of Michigan’s copper mines, the White Pine, ceased production in the mid 1990’s. 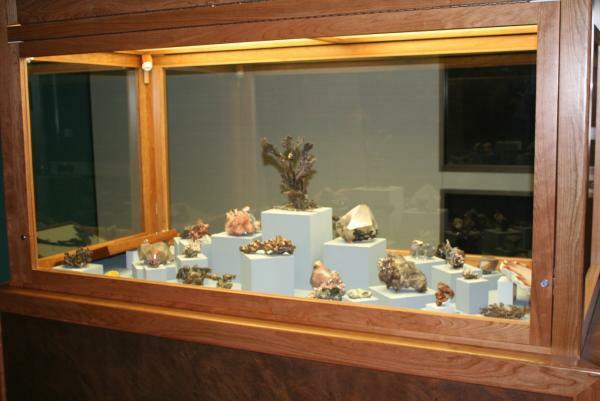 The Seaman Museum is definitely a Michigan jewel and preserves excellent examples of the mineral wealth of the state. The Keweenaw is a great place to visit both for mining history and rugged scenery. Mineral collecting today is both a pastime and a source of income for residents. The local rock club enjoys the luxury of access to multiple collecting sites for field activities. Gradually though mine piles are being hauled away for logging roads and a number of famous piles are gone or greatly reduced in volume. Also as increasing prices are paid for specimens young determined and strong-backed diggers have turned into human excavation machines. Some piles look like war zones. 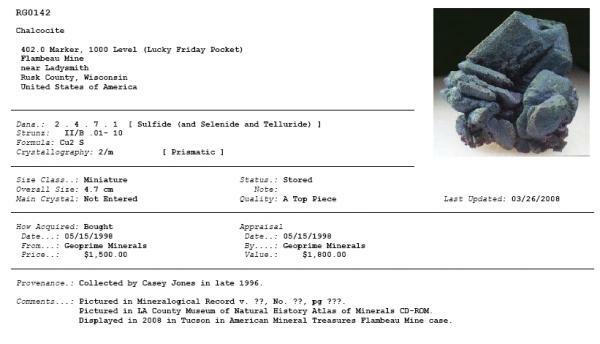 Yet it is quite amazing that ‘poor rock piles’ of mines that ceased production in the mid 1800’s have produced amazing new material in the last few years. 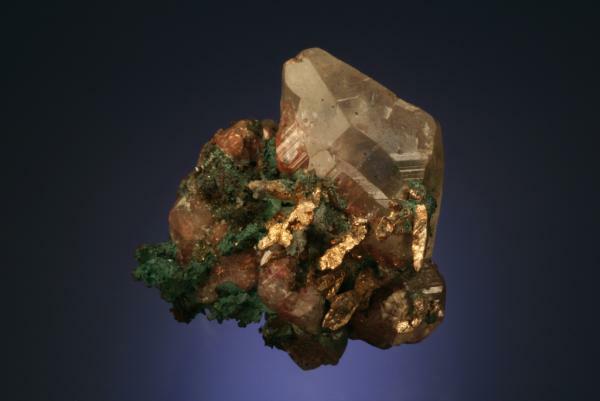 Excellent articles on mining and the minerals of the region can be found in the series of articles written by Tom Rosemeyer published in Rocks and Minerals. HOUGHTON - What was supposed to be a normal day on the construction site yielded an unusual discovery this week. 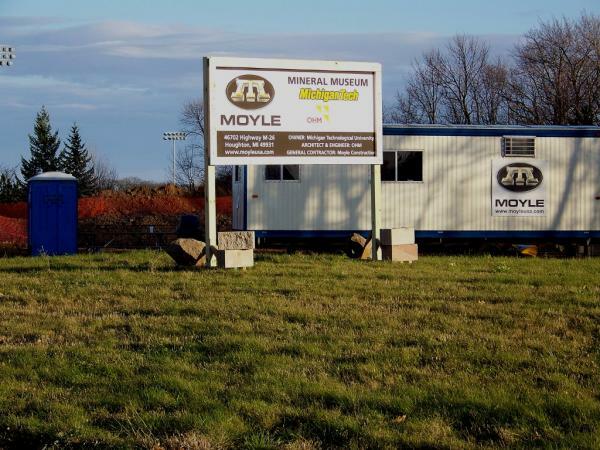 The crew at Moyle USA were working on the job at the site of the future A.E. Seaman Mineral Museum at Michigan Technological University on Sharon Avenue when they came across an interesting artifact in the ground - an old mine shaft. 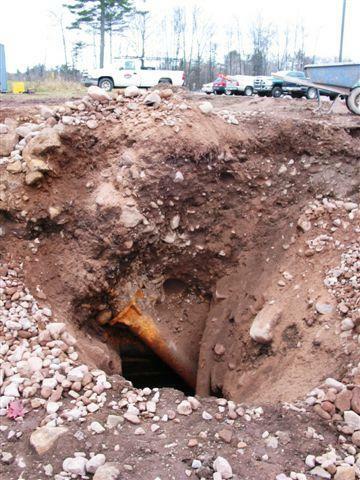 Mike Wilmers, project manager with facility management at Michigan Tech, said the mine shaft is likely an artifact from the 1880s when John and Austin Maabs had a company near the road. "From the records that we have here, there were either three or four of these mine shafts around there all in a row," he said. One is located closer to the ballfields just across the road while the one discovered this week is more in the middle. 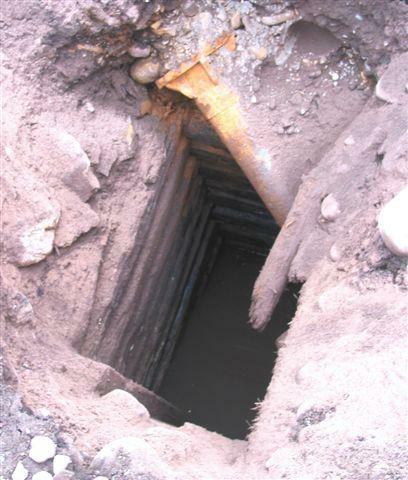 It's unknown how deep the shafts are, however, Wilmers said a mine inspector suspects the shafts are 80 to 200 feet deep. "We thought they were maybe 50 feet deep," he said. Just a few days ago, crews tried to fill in the vacant space with rock when something peculiar happened. "After they dumped a third large boulder rock into the shaft to try to see if we could hit bottom ... all of a sudden we heard from gurgling," he said. That's when water, like a geyser, shot straight up out of the hole, Wilmers said. "As soon as it came up and flooded the area, it sucked right back down, as if you flushed a toilet," he said. Today, crews worked on draining the flooded shaft as they have seen a continuous flow of water. "It's like a river," he said. Plans now are to pump it down as far as they can and make a decision from there. 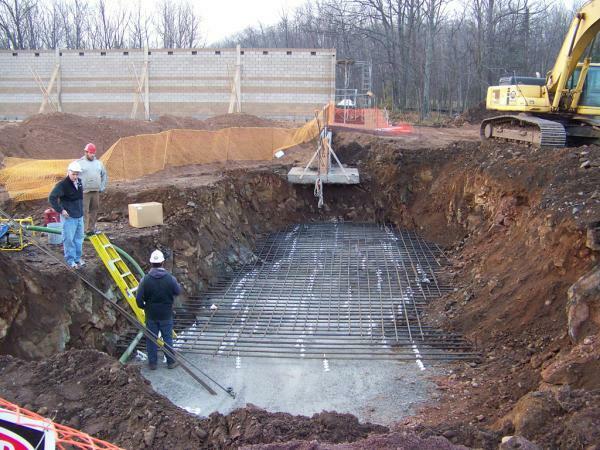 If the shaft is in fact 200 feet deep, it may be possible to reinforce a concrete cap and leave the shaft there. "It's all bedrock," he said. "Had that building been 10 feet east, we wouldn't have a problem. It is what it is." 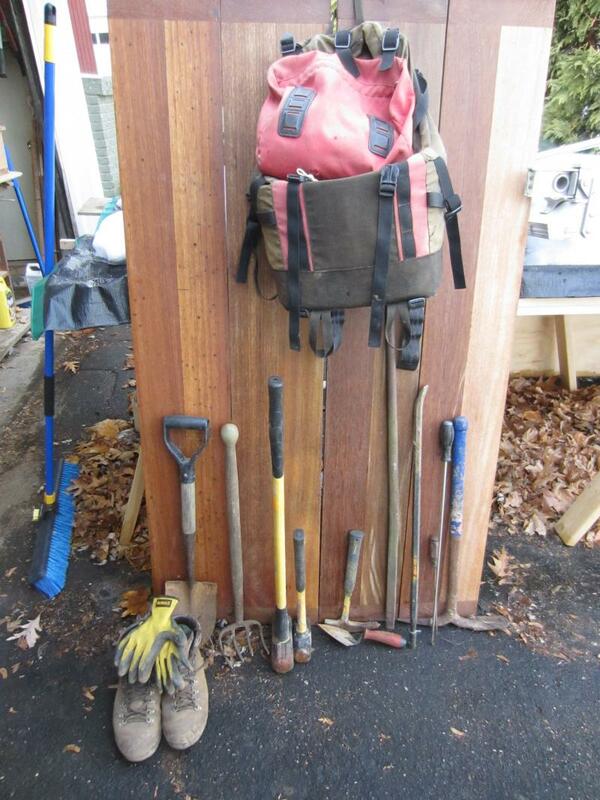 Even though the shaft has hindered progress slightly, it was an interesting find, Wilmers said. 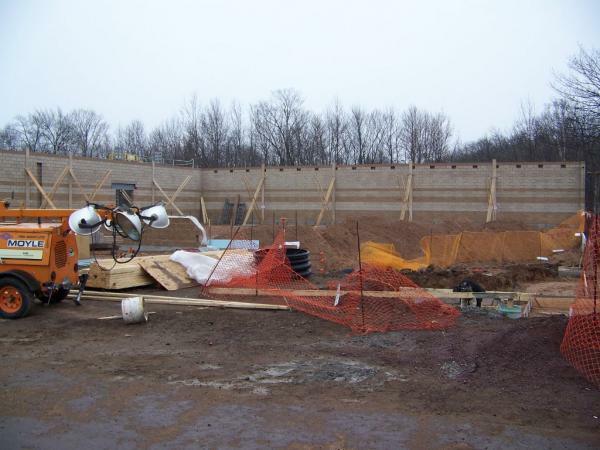 Here is the new museum site on the far south end of the Michigan Technological University campus as it looked on November 2, 2010 (before the shafts were discovered). 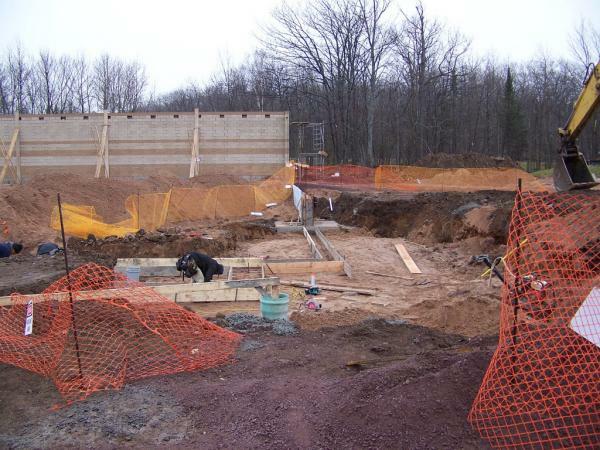 On November 2, 2010 many of the footers and foundations had been laid, and a rather large hole dug for good drainage and foundations was filled in. 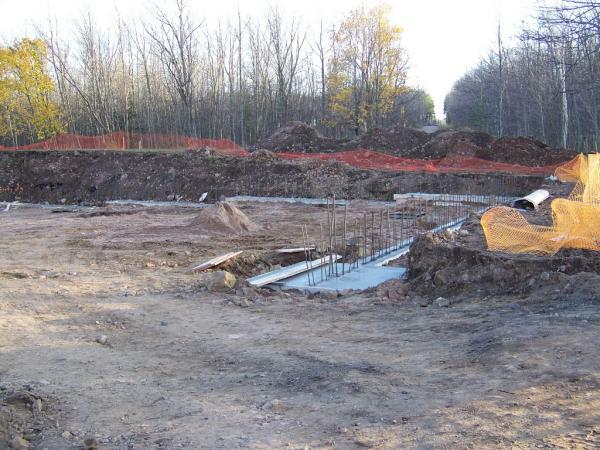 Foundations laid Nov 2, 2010. 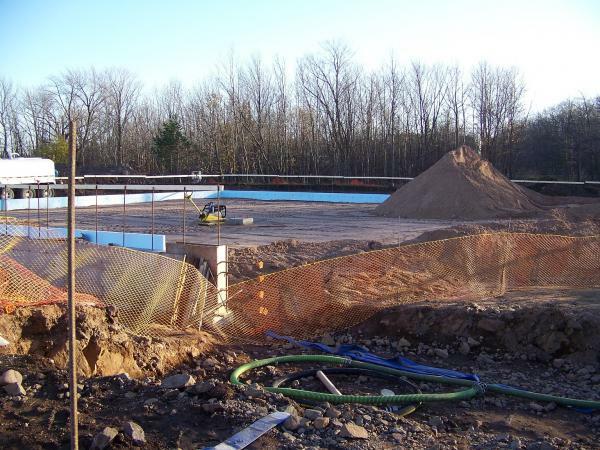 The large foundation at the right in the image is for the center of the west wall of the new building. It also happens to be almost directly above one of the shafts that was discovered in the next day or two. Compare the exposed shaft under the west wall's foundation on Nov. 7 after the initial shaft was further excavated, and much of the water was pumped out. Shaft under the west wall foundation. Nov 7, 2010. Some more images of the museum at the university before it was closed. Part of fluorescent exhibit, the best I have ever seen. Even while the caps on the shafts were curing, the south wall was finished and the east and north walls were being constructed. South wall. Nov 11, 2010. 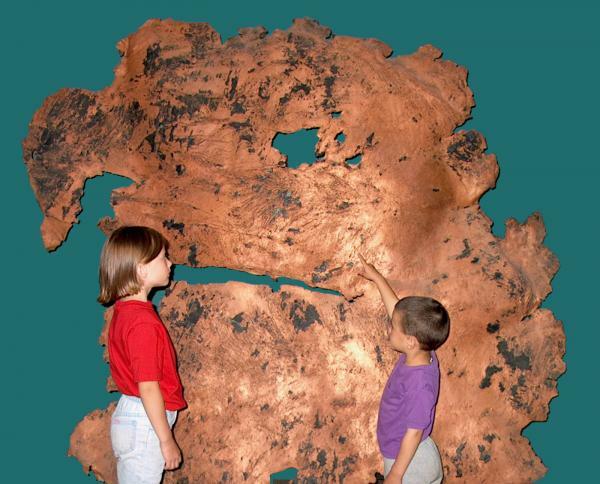 A large sheet of native copper from the White Pine mine greeted visitors in the old museum as they entered the Keweenaw gallery. White Pine mine sheet of copper. 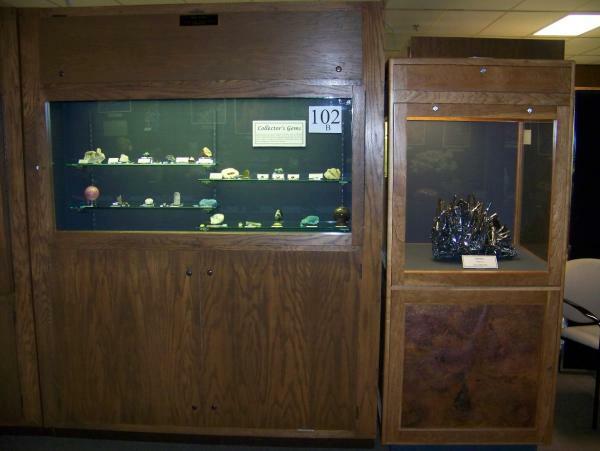 Some of the museum's finest minerals from the Keweenaw Peninsula were displayed in a custom-built case, also at the entrance to the Keweenaw gallery. Behind the case, on the wall is a large portrait of Douglas Houghton. Closer view of the Keweenaw's finest, featuring native copper, native silver, calcites with copper inclusions, datolite, chlorastrolite, and more. 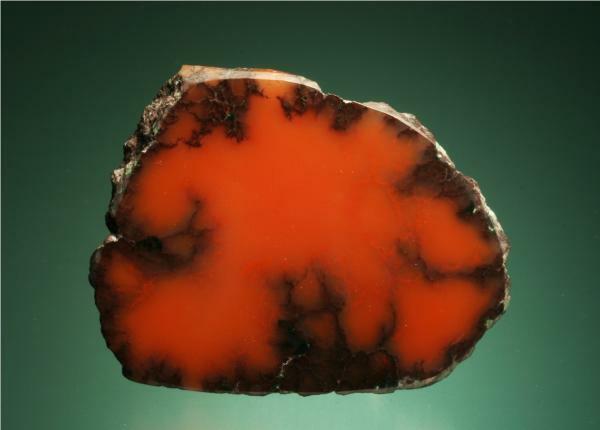 One of my favorite Lake Superior Agates. This is from Keweenaw Point, and is in the museum's collection. 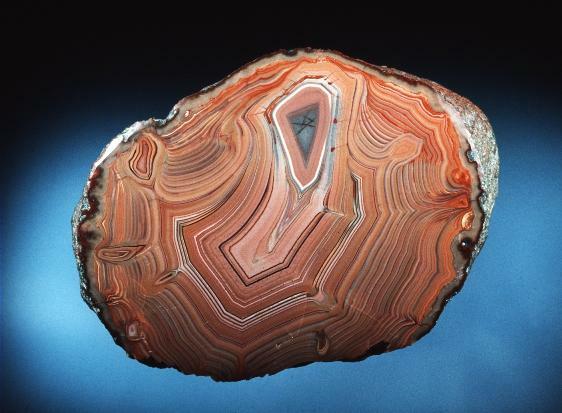 Lake Superior Agate. Keweenaw Point. There are some real treasures to be found in the Keweenaw Silver exhibit. Main Keweenaw gallery with silvers at the center, 3 cases of coppers to the left, history to the right, and geology at the back. 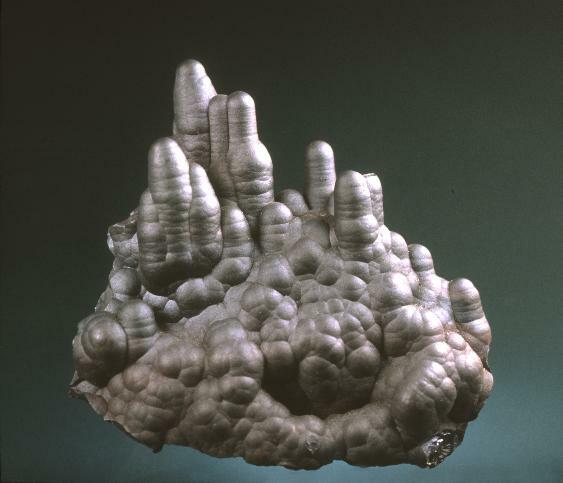 An exceedingly rare specimen of native silver associated with copper-included calcite. Quincy Mine, Hancock, MI. 4.1 x 4 x 3 cm from the John T. Reeder collection. 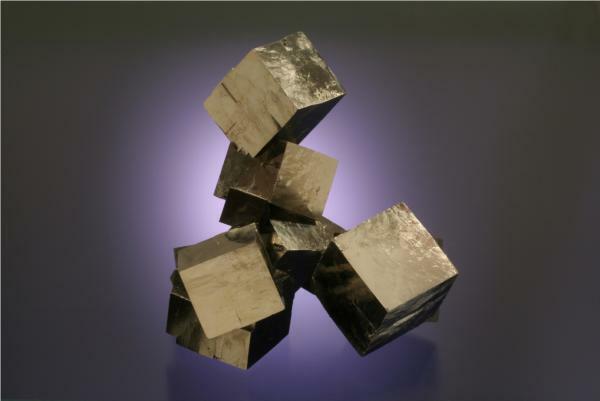 A classic Michigan silver specimen from the Michigan Mine, Ontonagon Co., MI, showing blades of herringbone twinned crystals. 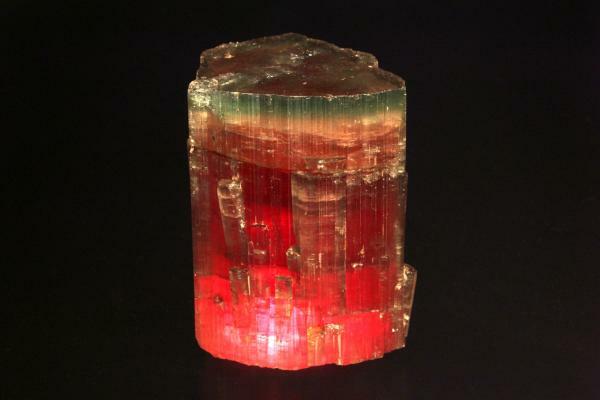 It is 6.8 x 6.4 x 3 cm and associated with minor quartz and epidote. 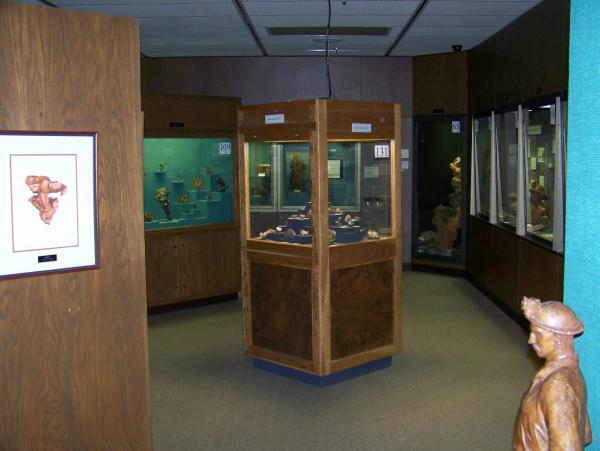 A. E. Seaman Mineral Museum; formerly in the John T. Reeder collection. Silver, Michigan Mine, Ontonagon Co., MI. Nov. 13, 2010. 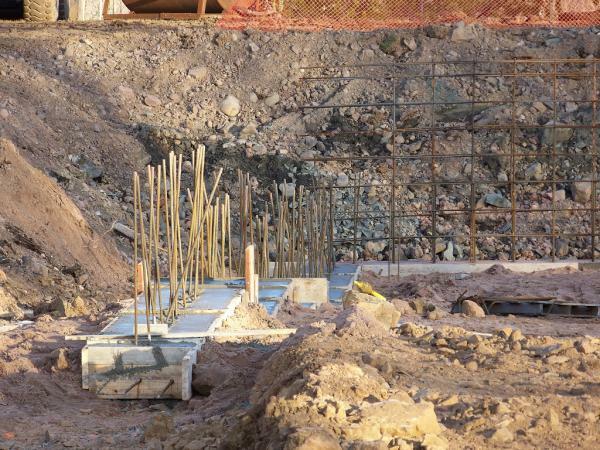 With the shafts capped, the final foundations for the new museum have been laid out at the northwest corner. The east as well as the south walls are now pretty much complete as well. Large flakes of wet snow fell much of the afternoon today as well. 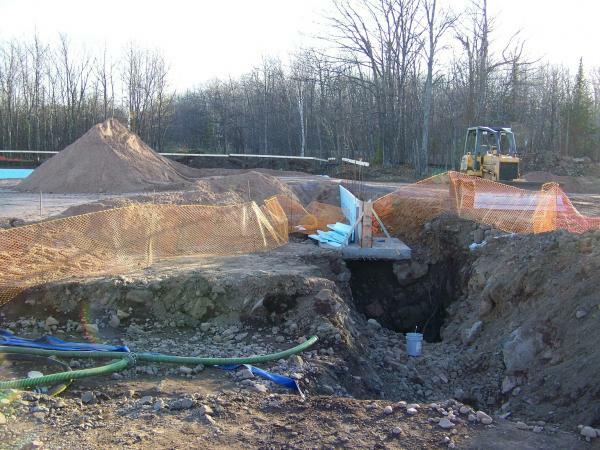 Final foundations laid over the capped shafts. Nov. 13, 2010. 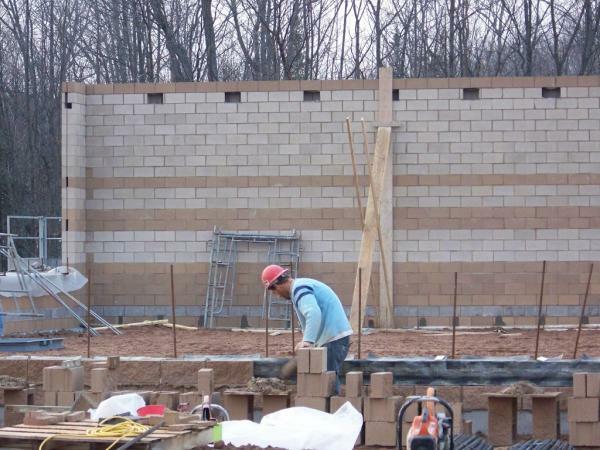 The east and south walls as of Nov. 13, 2010. 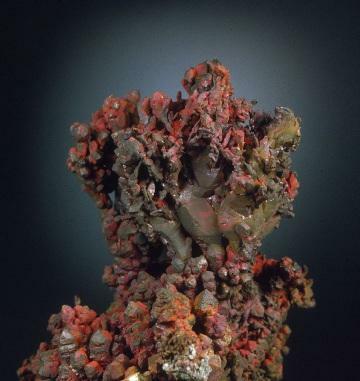 Here is one of the magnificent native copper specimens recovered by Bob Barron from the bottom of Lake Superior at Great Sand Bay in the so-called Laker Pocket. 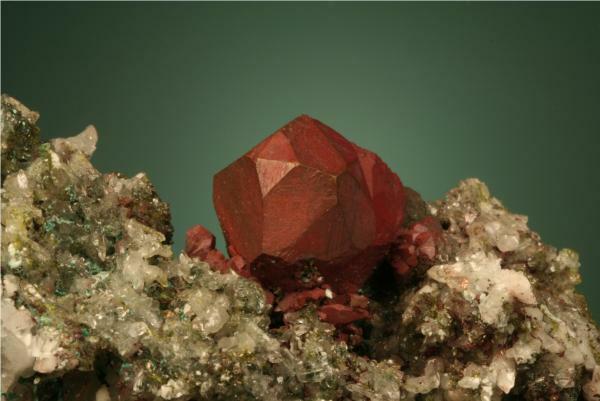 Tom Rosemeyer got to be on site for some of the collecting, and wrote a nice article in Rocks and Minerals vol. 84. (2009) p. 36. 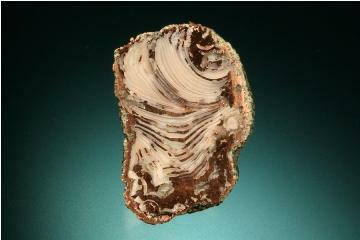 The museum was fortunate to be able to acquire several excellent specimens thanks to the Seaman Mineral Museum Society. 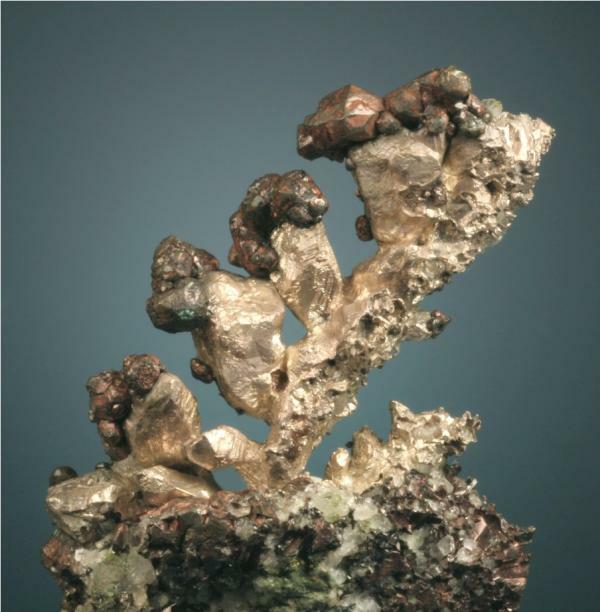 "Laker Pocket" copper from Great Sand Bay, Lake Superior in 2008. 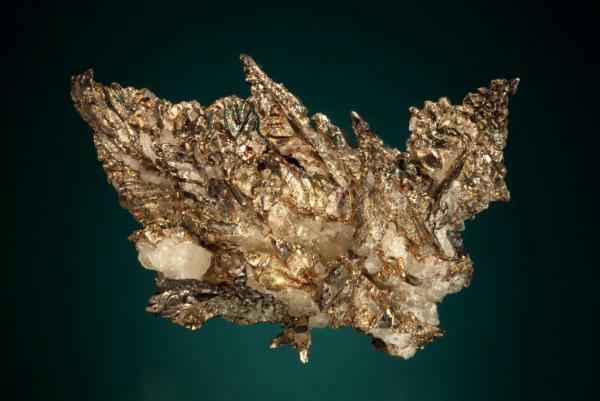 6.7x8.1 cm specimen.